When you take a look at the S4 at Audi Atlanta, you'll immediately notice the aggressive front grille. The SingleFrame grille is large and in charge. It utilizes a hexagonal shape that's wide and tall. Horizontal slats covered in shiny mirror chrome give the grille an athletic appearance. Of course, Audi's iconic logo completes the look. On the back end, the same mirror chrome finish is used on the exhaust outlets. 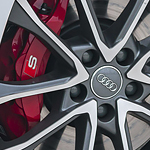 The S4 has four exhaust outlets that are positioned on the left and right sides of the rear end. They complement the back of the sedan and are surrounded by a sculpted lip for added flair.